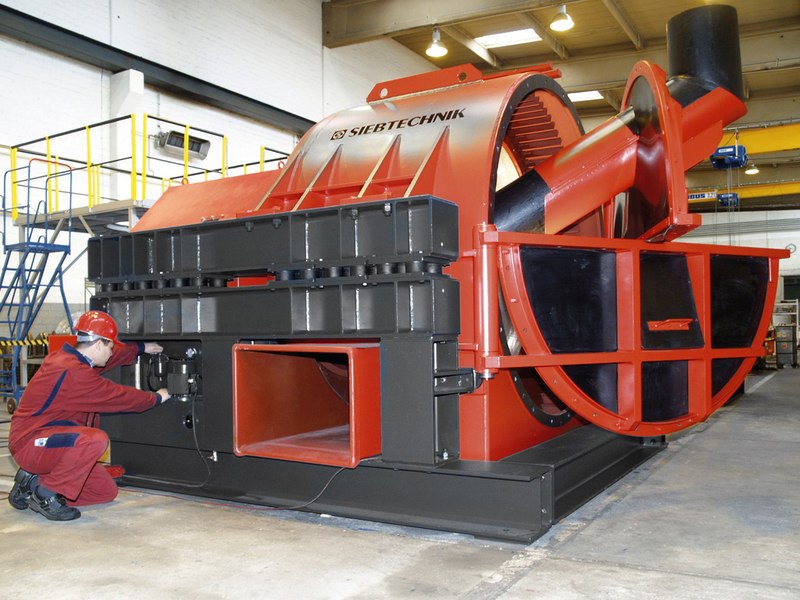 HSG vibrating centrifuge by SIEBTECHNIK TEMA. 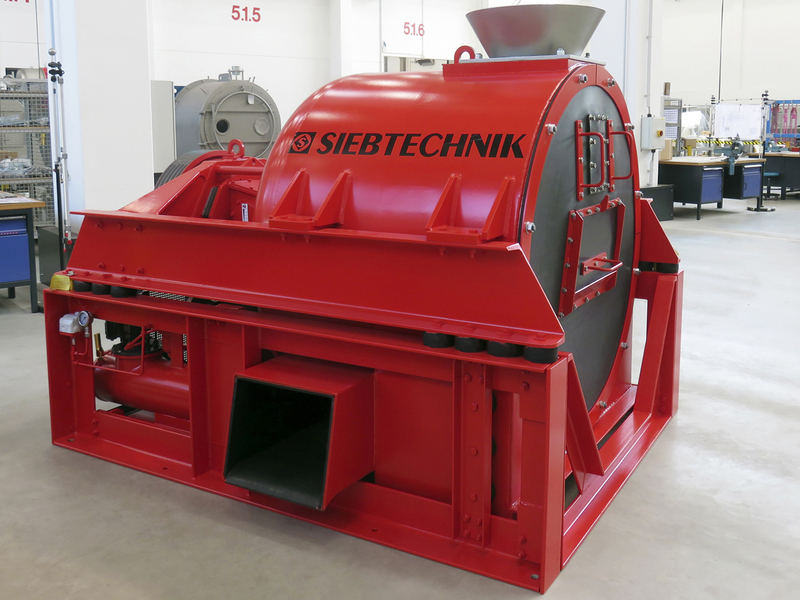 With the SIEBTECHNIK HSG vibrating centrifuge you can continuously dewater the largest quantities of solid material in the world. 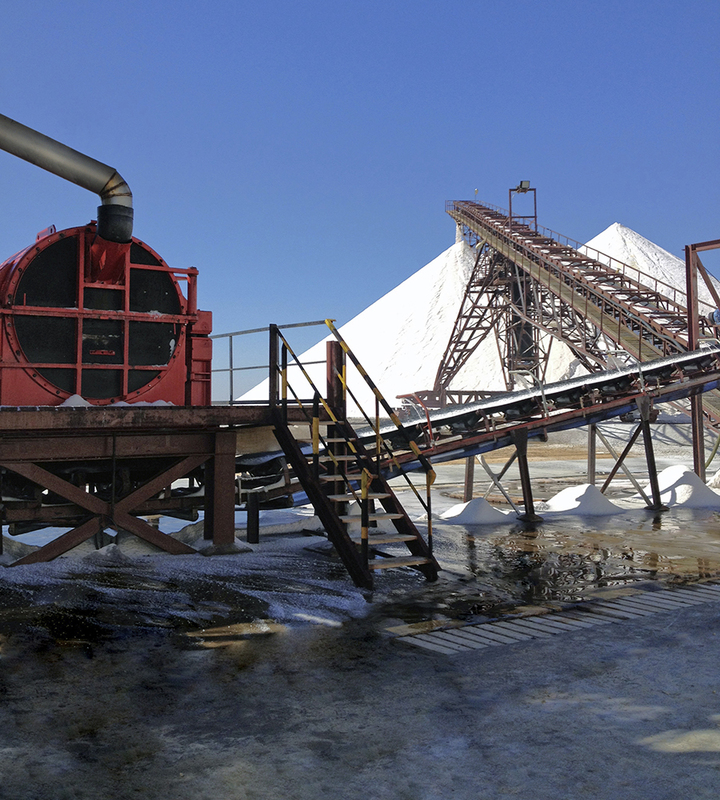 Coarse salts, sea salt, potash, coal, sand or whatever: the HSG continuously dewaters the largest quantities of solid material reliably, fully automatically and self-regulatingly. Even with fluctuating feeds the HSG does its work at the lowest possible energy cost. 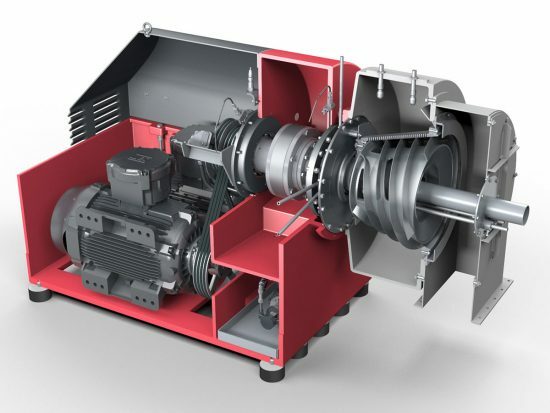 Steady and continuous operation and a maintenance-friendly construction are the result of over 70 years of consistent further-development of SIEBTECHNIK HSG centrifuges. 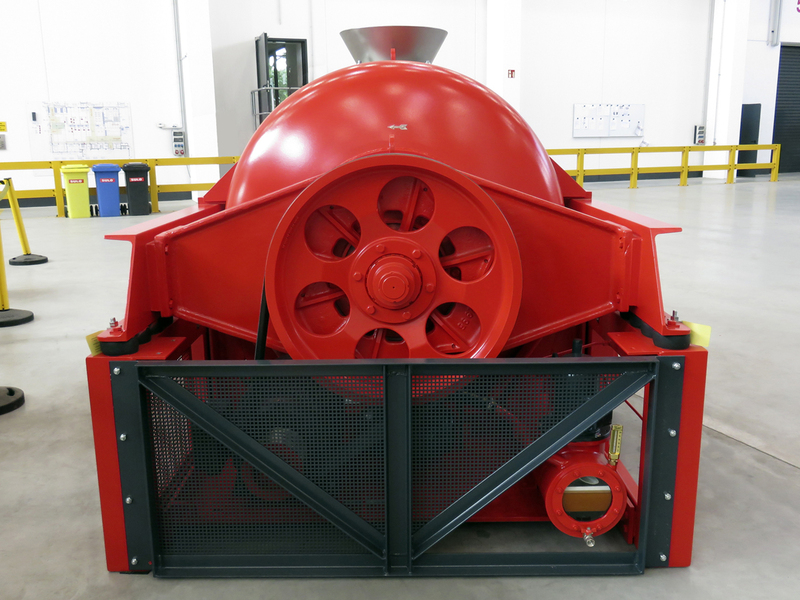 The HSG vibrating centrifuge is our best-performing centrifuge with regard to solid material throughput. 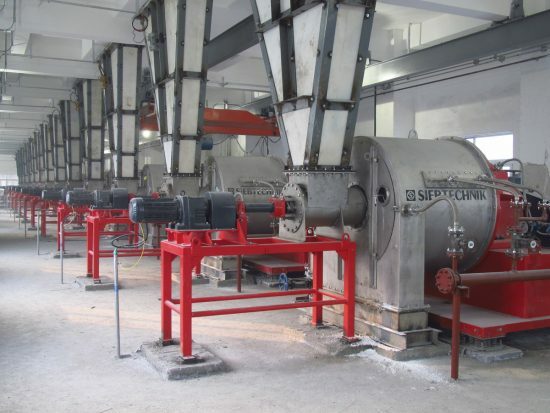 It is suited above all for coarse-grained or otherwise easy-to-dewater mass materials such as washed fine coal, middlings or washed smalls in mineral coal processing, for solution and washing residues in potash processing, sea salt, concrete sand, etc. The solid material is conveyed over the screen of the conically tapered bowl by the combined action of the tilt and axial vibration of the bowl. The precondition for a controlled sliding speed is that the angle of tilt is somewhat smaller than the slide friction angle of the product to be dewatered and that the axial vibration acceleration is sufficient to overcome the remaining difference in product friction on the screen. Because narrow limits are set for vibration acceleration during design, vibrating centrifuges must normally be operated with centrifugal accelerations of less than 120 xg. Screen basket, inlet cone, shaft and bearing housing form the small mass of a vibration system that is coupled via rubber springs to the large mass consisting of cross-member and product housing. Vibration is excited by means of contra-rotatory unbalance masses in the resonance range a little below natural frequency. Because of this very stable vibration characteristics are guaranteed for excitation, even with a low output requirement. With higher loads on the machines, that is, enlargement of the small mass through product build-up in the bowl, their natural frequency diminishes and approaches exciter speed, so becoming more resonant. This causes the vibration amplitude and the conveying speed of the solid matter in the bowl to automatically increases. The machine “works itself free”, is self-regulating and within broad limits adapts itself faultlessly to feed fluctuations. The bowl and vibration exciter are driven via V-belts by means of three-phase motors. 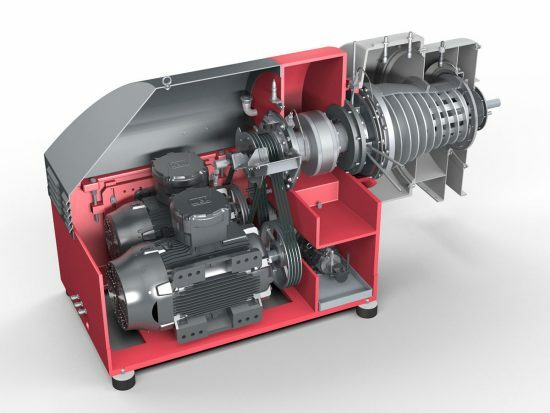 So the speed can be easily adjusted to suit operating conditions. Drive motors and reservoir with a pump for the oil-circuit lubrication of all bearings are fastened to a base frame on which the centrifuge is also mounted via vibration-proof rubber buffers. 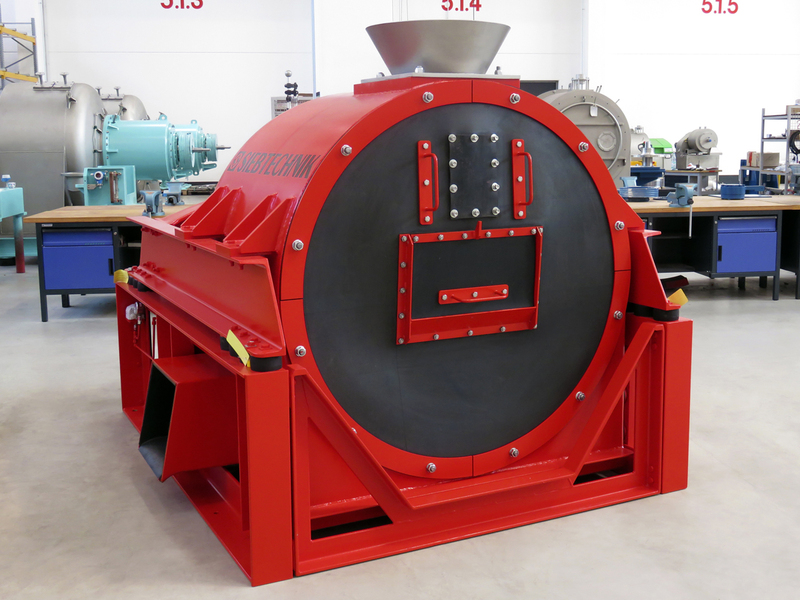 Like all of our continuously operating centrifuges, the vibrating centrifuge can be installed even at higher floor levels without a special foundation or reinforcement. The profile wires of the slotted screen baskets are made of stainless steel. The inlet cone and feed pipe are, if required, manufactured from wear- and/or corrosion-resistant materials. 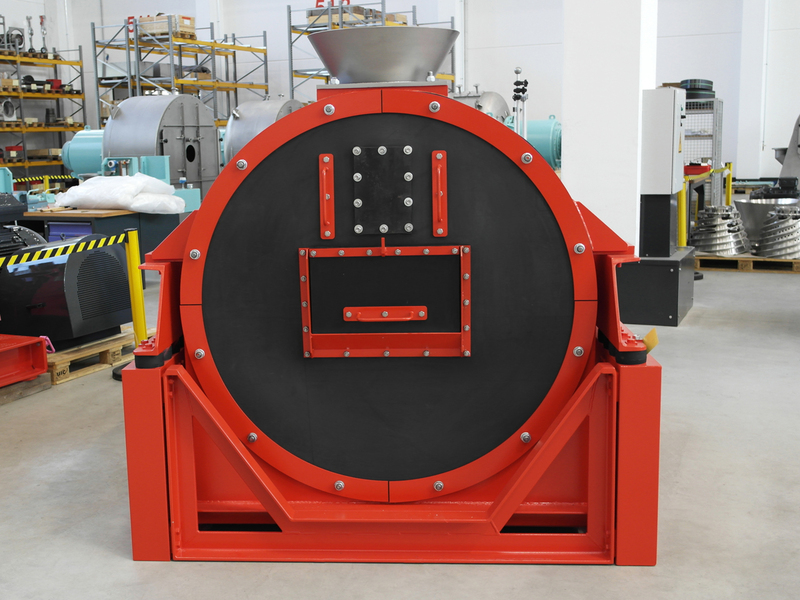 The product housing is made of steel and can be supplied with rubber, ceramic or other linings as wear protection in the solids discharge area.